Or, once inside the Law Journal Library, click the Citation tab and then click on Citation Navigator. 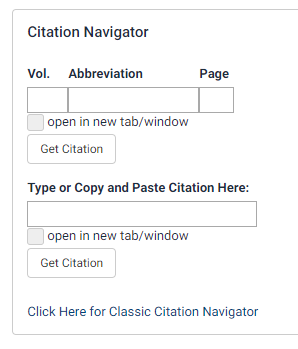 Use the first option to type the citation into the navigator. The Abbreviation field will auto-fill as you start typing. Click “Get Citation” to be taken to the article. The second option allows you to copy and paste a citation. Click “Get Citation” to be taken to the article. Can I browse to find an article instead of searching? Where can I view the top 100 most-cited articles, journals, or authors in the Law Journal Library? I want to search across a specific journal, but I don’t know the Bluebook citation to use from the title listing on the search page. What should I do? How do I search for law review articles by country or U.S. state? How do I search for law review articles by subject?